I really like the Ruth card that we have for auction this week. 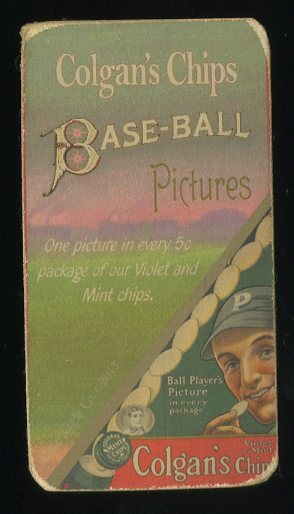 First, I’ve loved this cigarette card format now for over 40 years and it is great fun to work within this formula. 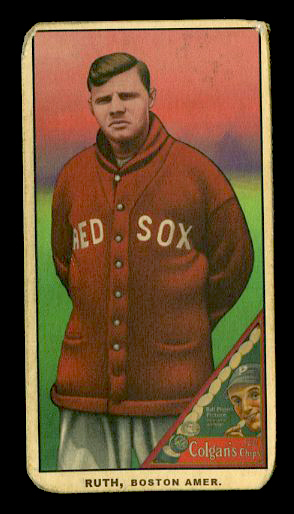 And Ruth is posed as a young player with Boston-kind of a neat thing. It is also a Colgan’s Chips version, front and back. While there will be just a handful of these Ruth T206-Helmar cards made, just six total pieces will have the Colgan’s format. Each of the six will have different scenes behind the Ruth figure, making each unique, and this is one of my favorite versions. The painting of Ruth was done by Sanjay Verma and I do think that he really captured the big man’s essence. The sweater is a nice touch, I think that they are always a nice change of pace. « Finally, on to the Boston Nationals! Great Uniforms.